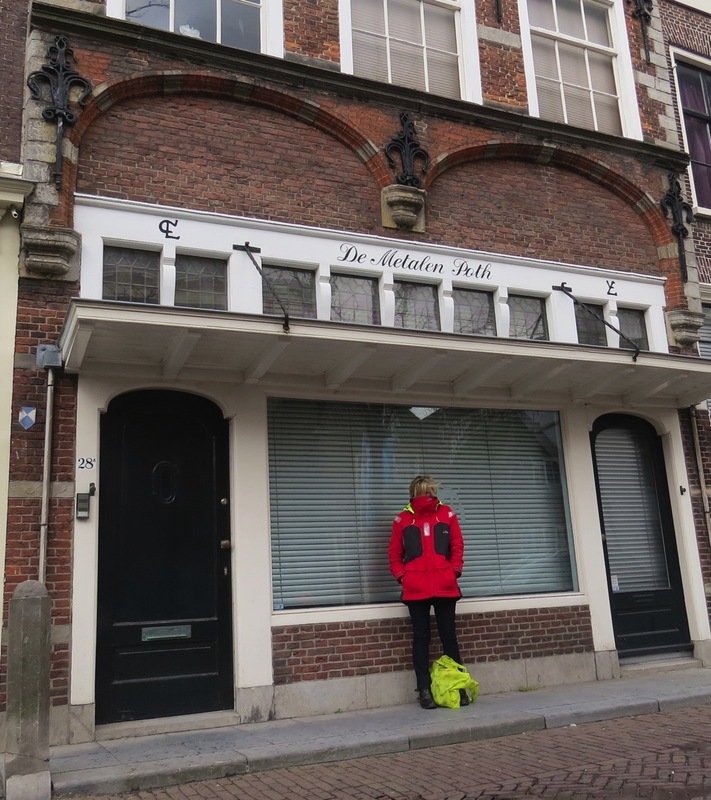 With JUANONA comfortably settled in Haarlem we took advantage of the reliable and inexpensive train service to explore several towns further south, the first being Delft. Identified by many guide books as a quintessential Dutch canal town, we knew we’d enjoy strolling Delft’s winding streets ribboned by small canals (added in the 15th century to connect the river Maas) and lined with medieval Gothic and Renaissance homes. We easily spotted the leaning spire of the Gothic Oude Kerk (old church). With the land being a bit soggy, many of these buildings can’t support a big load such as this one currently leaning out at 2 meters (4+ feet). Due to the precariousness of this tower, the bells they only dare toll for extremely special occasions. Close to the Oude Kerk is the former house Jan de Huyter constructed around 1500. Emperor Charles V slept here during his 1540 visit to this fair city and later the daughter of Willem van Oranje also visited. The stone is gorgeous and well-maintained. Wooden coats of arms decorate the main door, which you can just make out below. Currently the Delfland higher water board is based here, responsible for keeping the water level of a boezem (outlet/drainage system of a polder, aka, drained field) at or below its maximum level. And, believe me, from the looks of the houses whose backyard is the canal this seems to be measured in inches, not feet. You read about how the royal family likes to mix in with their citizens, and here’s some evidence of that: Just down the street from the huge stone house was the less-grand townhouse where the second son of Queen Beatrix lived during his engineering studies at the local university (he died in a tragic skiing accident in 2013). We also passed the smallest house in town with its bronze head of the municipal doctor who was also Willem van Oranje’s physician. I had only associated the city’s name with its famous pottery. With all the blue-and-white souvenirs, including this huge cabinet on the street, it was easy to be reminded of this connection. Ironically, many of the early ones were manufactured in China, the country whose famous porcelain inspired the Dutch to create knock-offs beginning in the 1600s. (As opposed to being made of porcelain clay, Delft potters used clay coated with a tin glaze after firing.) Over 20 factories popped up during the 17th and 18th centuries to satisfy demand for this earthenware pottery. Today, one factory still exists with several shops in town demonstrating the technique. We resisted the numerous blue-and-white tchotchkes (for beautiful pottery, check out our friend Rebecca Esty’s) and headed for the other famous name associated with Delft: Johannes Vermeer (1632-75), one of the great Dutch masters. Although he lived his entire life here with his wife and 11 children, there are very few, if any, of his 35 authenticated paintings in Delft. However, banners heralding ”Vermeer is coming home” broadcast an exhibit featuring one of his famous paintings, “The Little Street”. The reason for all of the hype was due to art historians over several centuries trying to identify the exact location featured in Vermeer’s painting. In 2015 a new theory was published by a professor of art history who claims he found the street based on the two arched passageways (only one of which exists today). I’m sure it was an exciting discovery but for us it was just pleasant seeing the real painting on loan. The more interesting tour down the street showcases Vermeer’s studio (replica), life-sized copies of his paintings, pigments he would have used for paints, his use of light and brush strokes, and a short film on restoring “The Milkmaid”. I definitely could have stayed here for several more hours. I find the technical details fascinating and only wish I could have had one of my godsons, who studied art restoration, explain it all as we peered at Vermeer’s work. Another famous personage connected to this small town is the man considered the founder of the Netherlands, Willem van Oranje (1533-84) (aka Willem the Silent due to his considered approach to matters). 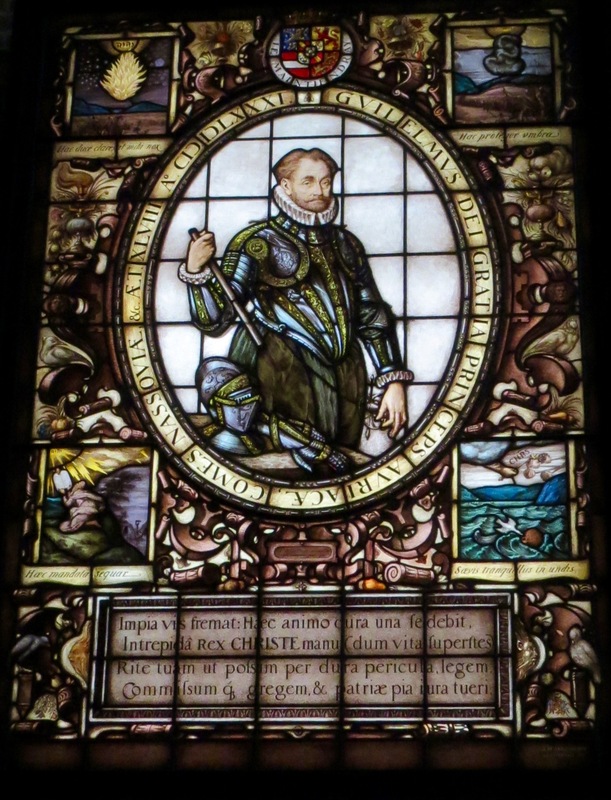 This is the gentleman who joined rebels fighting the son of the Holy Roman Emperor Charles V, King Philip II of Spain. The Eighty Years’ War began with stadtholders’ protests of feeling excluded from governing their own lands to one of outright rebellion due to the persecution of Protestants by the Catholic King and his followers (i.e., Inquisition and other delights all in the name of religion). A former, dignitary-hosting convent (now the Municipal Museum het Prinsenhof) where Willem and his family kept court also features the staircase and bullet holes where he was assassinated July 10th 1584 by a fanatical Catholic, Bathasar Gerards. 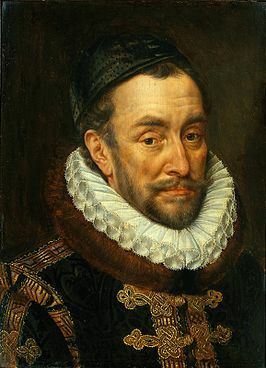 The assassin may have also been motivated by a bounty on Willem’s head: 25,000 gold coins (which Philip II did pay to Gerard’s family) and elevation to nobility. However, not only was it a bad end for this founder of Dutch independence, but also for Gerards. The latter was caught, subjected to daily tortures, and finalized with a public execution involving red-hot irons, pincers, swords, and chopping. Definitely not a pleasant way to go. Along with the site of the assassination, the museum provides information about the rebellion and all the players, including portraits of Willem’s four wives. One interesting tidbit: his second wife had an affair with Jan Rubens, the future dad of Peter Paul Rubens. Again, more hours could have been spent absorbing more of the Netherlands’ history. 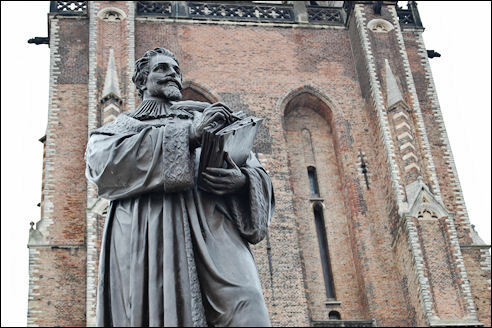 and Hugo Grotius (1583-1645), “Father of International Law”, whose statue stands in middle of the market square. A child prodigy and later a rebel, Grotius is also known for his escape in 1621 in a book chest after being imprisoned for treason two years earlier. There’s not much left of his Delft home but I still wanted a snapshot. Hugo Grotius’ memorial is also here. Facing the New Church across the Markt (the market) stood the town hall. Burnt down in 1618, a new one quickly replaced it two years later in the Renaissance style. Today the view was partially blocked by a stage being erected for tomorrow’s annual royal Day celebration (currently called King’s Day since Queen Beatrix abdicated 2013 in favor of her son Willem-Alexander). Part of the town hall encompasses a medieval prison tower, which is located at the back of the main building. we came to the only remaining city gate (the East gate) from the 1400s, now a private residence (lucky folk!). Our last stop was one of the six Dutch offices of the VOC (Vereenigde Oost-Indische Compagnie) or Dutch East India Company founded in 1602. Formed from small, independent trading companies, the VOC is considered to be the world’s first multi-national company. Granted the right to protect the Dutch trading routes in the Indian Ocean, this consortium brought immense wealth to the Dutch Republic during the 17th and 18th centuries thanks to a monopoly on all trade east of the Cape of Good Hope. But, all ‘good’ things come to pass, and the VOC filed bankruptcy in 1798 due to corruption, lack of capital, overly high dividends (18% for its shareholders), and competition. And, yes, it was still cold. With that we walked back to the train station and a warm ride home to Haarlem. This entry was posted in 2016 04 NETHERLANDS, 2016 Summer Cruising, COUNTRY, Europe, Netherlands, SUMMER CRUISING on May 8, 2016 by margaretlynnie. There’s a Vermeer in the Getty Museum in LA of a young girl (not the Milkmaid) that I was absolutely taken with. I love his work. Love the quack quack photos!